– 10% discount off the base fare for travel on Mondays, Thursdays, and Fridays and/or a 20% discount off the base fare for travel on Tuesdays, Wednesdays, and Saturdays. – Discount will apply for travel between November 8, 2013 and December 17, 2013 for the following routes, in either direction: Austin- San Francisco, Dallas- Los Angeles, Dallas- San Francisco, Seattle- Los Angeles, Seattle – San Francisco, Portland – San Francisco,, Los Angeles – San Francisco, Los Angeles – San Jose, Las Vegas – Los Angeles, Las Vegas San Francisco and San Diego- San Francisco. – Discount will apply for travel between November 12, 2013 and December 17, 2013 for the following routes, in either direction: Boston – Los Angeles/ San Francisco, Newark – Los Angeles/ San Fransico, JFK – San Francisco/Los Angeles/Las Vegas, Washington Dulles – Los Angeles/ San Francisco, Philadelphia – San Francisco/Los Angeles, Ft. Lauderdale – Los Angeles/San Francisco, Chicago O’Hare- San Francisco/Los Angeles. – Promo code may be used only towards newly booked travel and may not be applied to prior bookings. 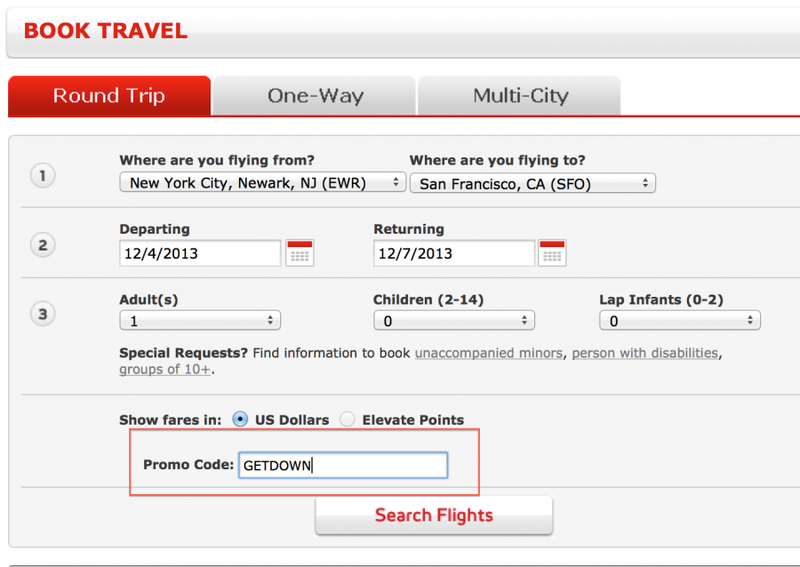 – Promo code is not eligible for Elevate points redemption bookings. I priced this out on a Wednesday-Saturday Newark to San Francisco booking for December 4-7, 2013. Without the code the fare was $357.80- but with GETDOWN it dropped to $290.60. Clearly there are some hoops to jump through, but the savings can be decent if you can work it around your schedule!